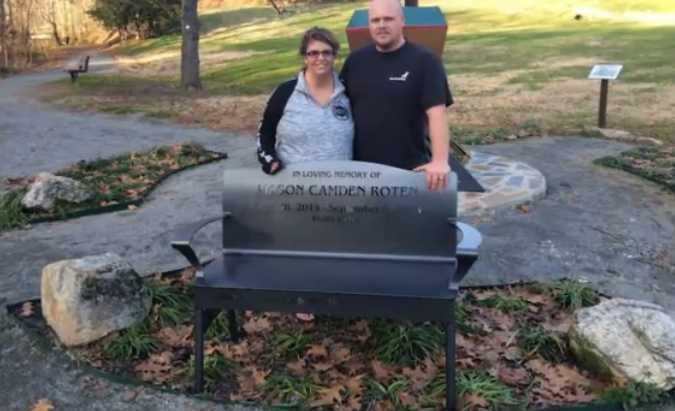 ELKIN, N.C. — A bench placed in memory of a toddler that was killed in September in a hit-and-run car accident has been removed from a public park after officials said that permission was not obtained to place it—an assertion that the family denies. Mason Roten was 16 months old when a car pushed the vehicle his father was driving off the road and into a tree, which subsequently fell and crushed the child in his seat. Last weekend, a memorial was placed Elkin Municipal Park, near the playground when Roten and his brother would play each week. The bench included the child’s name and a quotation from Psalm 127:3, along with two cutout crosses. “Children are a gift from the Lord. They are a reward from Him,” it read. Alumni from Elkin High School placed the bench, and state that they first obtaining permission from the town. Ben Whitecross says that he specifically obtained permission from Parks and Recreation Director Adam McComb. But on Monday, the bench was removed, and Whitecross states that he was told that it was because of the Bible verse and crosses on the memorial. But Town Manager John Holcomb asserts that alumni never obtained permission for the placement of the bench. He said that the town is seeking to move the bench to another location. Heather Roten is unhappy with Holcomb’s statements. A meeting is scheduled over the matter on Dec. 14.